It’s that time of year again. You’re packing for a Thanksgiving trip that you don’t want to take. As always, you’ll rehash old arguments with your younger sister, listen to the rants of your ill-informed uncle, and try to figure out what your passive-aggressive mother-in-law really wants. This is when you wish you could escape to a deserted island. The Bounty Islands should be far enough away. 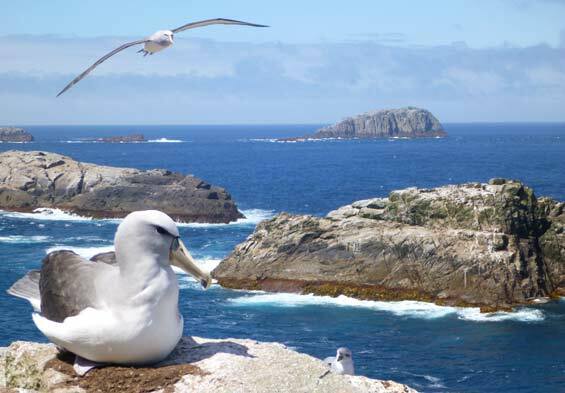 You’ve never heard of the subantarctic islands? Perfect. That means no one in your family has either. The 13 islands (plus a bunch of rocks) are a territory of New Zealand. They lie more than 400 miles east-south-east of the mainland in the south Pacific. They’re also the most remote and least visited of New Zealand’s islands. They’ll never find you there. Actually, no one—not just your family—would ever find you on the Bounty Islands. The islands were first discovered by a British Royal Navy captain in 1788. He must have been way off course, as he was en route to Tahiti. But at least he got to name the islands after his ship. In the 19th century, the islands became a popular hunting ground for sealers. The horrible weather, the lack of fresh water, and the lack of safe anchorage prevented them from creating a depot on prematurely named Depot Island, the largest of the islands, though. But not before they practically hunted New Zealand fur seals into extinction. Since then, the islands have been left alone for the most part. The islands have flourished, by nature’s standards, since being ignored. The granite islands, long bare from frequent rain and spray from large waves, now grow an herb called Cook’s scurvy grass. Bounty shags, one of the world’s rarest cormorants, live here all year. Erect-crested penguins and Salvin’s mollymawks use them as a breeding site. The islands are an Important Bird Area because of them. While the long-nosed New Zealand fur seals have made a surprising comeback in recent years. The islands were even named a UNESCO World Heritage Site along with the rest of the New Zealand Subantarctic Islands. So maybe you shouldn’t visit the Bounty Islands. They should be left alone to continue to thrive. It would be really, really difficult to get there anyway. But you can still dream about them. They can be your happy place when you need to tune out all of your relatives next week. It will make it a much happier Thanksgiving all the way around.